Vegan Doner and Vegan Gyros from German firm Wheaty, bought from Vx. 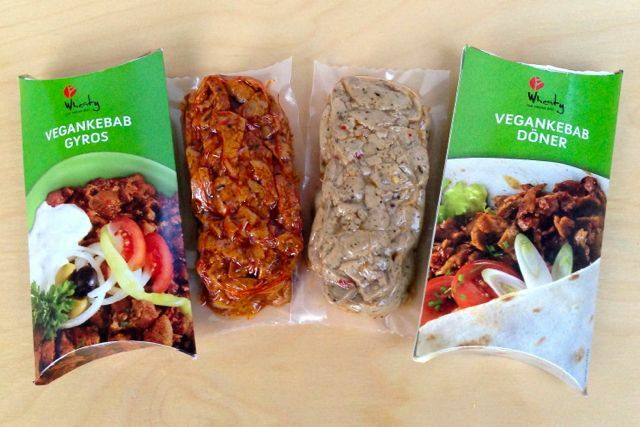 We've seen vegan kebabs before such as the Vebab, but never pre-packaged ones such as these. Based entirely on wheat protein these kebab 'meats' are intended to replicate the thin slivers of lamb cut from those rotating spits seen in kebab shops. We can't remember what kebab tastes like, but are these kebabs worth seeking out to extend the vegan food experience?